Santa Rosa's overall area is 107.5 square kilometers, 106.9 square kilometers of which is land and 0.5 square kilometers is water. Santa Rosa is composed of 5 neighborhoods with the downtown area in the middle. That division is based on the relatively equal quadrants dividing the city. Each area of the town has its history, background, and culture. First neighborhood, Downtown Santa Rosa, is divided into three parts. The first one is Downtown Main Street or the Courthouse Square lying between 3rd and 4th streets. Fourth Street is the main street of Sonoma where all pubs, restaurants, a bookstore, a library, and coffee shops like Starbucks and Peet's Coffee and Tea are located. The Russian River Brewing Company takes place here as well. Another area that might be interesting to visit there is the Luther Burbank Home and Gardens. The next part of the Downtown Santa Rosa is Historic Railroad Square located on the western side of the downtown area. It is also considered as the first historical downtown of Santa Rosa. Several coffee houses, antique stores, excellent restaurants, and hotels are located in that area. Among the favorite places, the tourists like to visit is the statue of Snoopy character produced by Peanuts creator Charles Shultz. Santa Rosa Plaza is the place where Highway 101 and Highway 12 meet. The shopping center hosts around 120 branded stores as Foot Locker, Sephora, Starbucks, Forever 21, Macy's, Sears, etc. Just three blocks away from the city center there is the History Museum of Sonoma County which covers the history from the first native Americans to the earliest Mexican and Russian arrivals. After the earthquakes and due to poor city planning the downtown of Santa Rosa has lost its charm. The second neighborhood, Northwest Santa Rosa, is located north of Highway 12 and west of Highway 101. The largest swimming pool at the ‘Finley Aquatic Center' is located in this area as well as the Redwood Empire Ice Arena. Therefore, that part of Santa Rosa is known for its sports heritage. The following neighborhood, Northeast Santa Rosa, is located is located north of Highway 12 and east of Highway 101. One of the sightseeing points of the area is McDonald Historic District which has been the setting for many favorite movies. The fourth neighborhood, Southwest Santa Rosa, is located is located south of Highway 12 and west of Highway 101. One of the best-known communities in that area is Roseland Village. The Santa Rosa Auto Row on Corby Avenue offers visitors a wide range of car for sale. 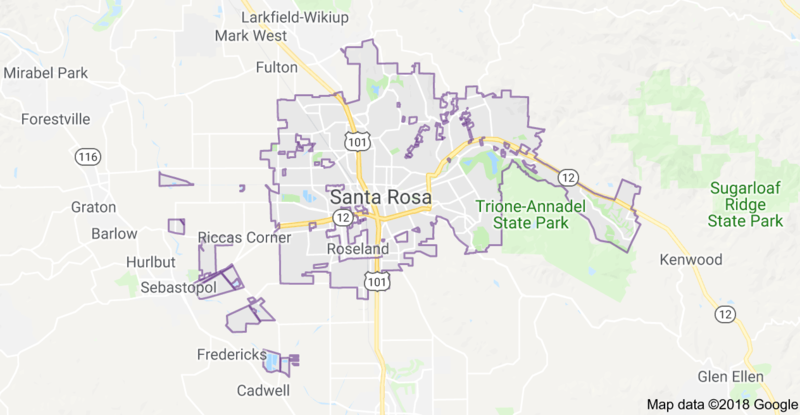 The fifth and the last neighborhood, Southeast Santa Rosa, is located is located south of Highway 12 and east of Highway 101. That was the original place where the building of the city has started, the very first house of Santa Rosa is still standing there. Montgomery Village shopping center and Bennett Valley golf course are available for visitors' attention in that area. Hogarth Park, Spring Lake, and Annadel Park would be a perfect place to rest in the shadow of the tree for an hour or so.